1906 March. 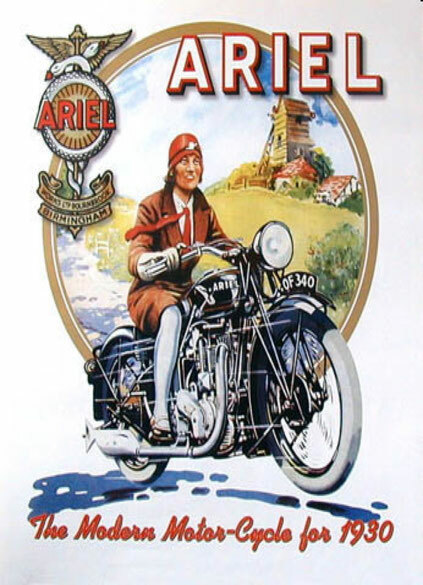 Ariel Motors (1906) Ltd was formed to take over Ariel Motors Ltd and to carry on the business of manufacturers of 'Ariel' and 'Ariel-Simplex' cars. 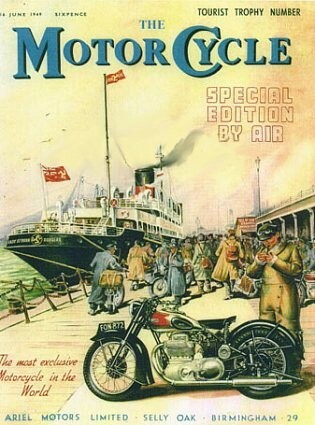 Planning to open negotiations with Bruce Peebles and Co for reciprocal working. 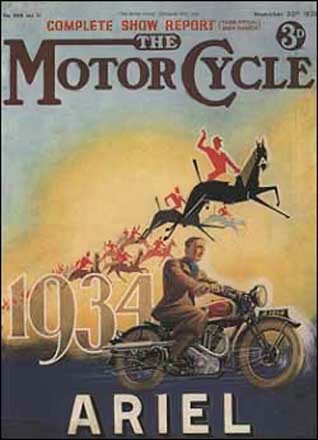 Directors are: J. F. Albright, Arthur C. Peebles, Gerard B. Elkington, J. E. Hutton and Charles T. B. Sangster. 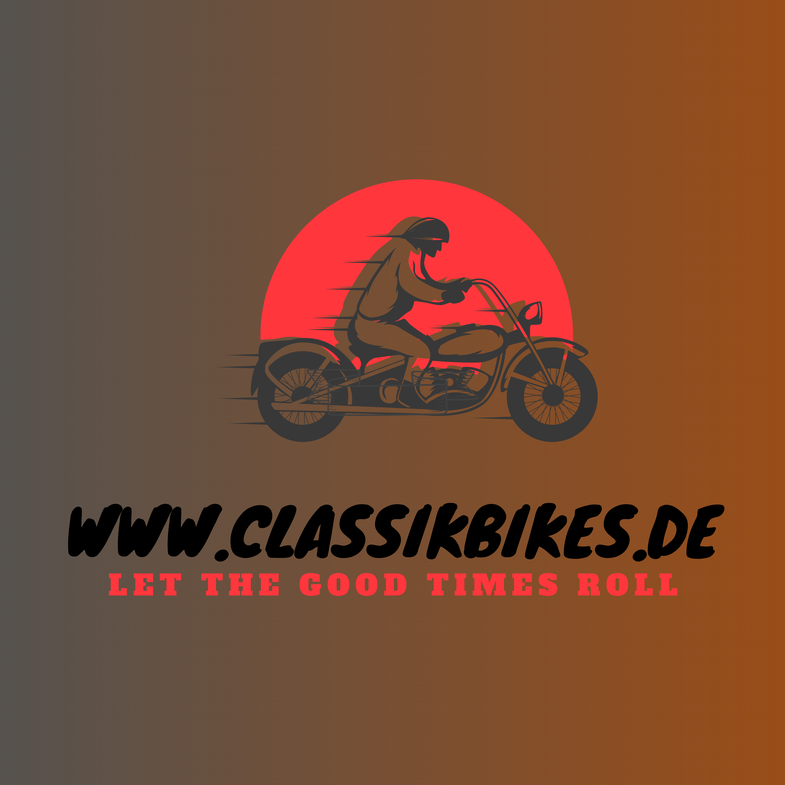 1961 Manufacturers of motor cycles and motor cycle accessories. 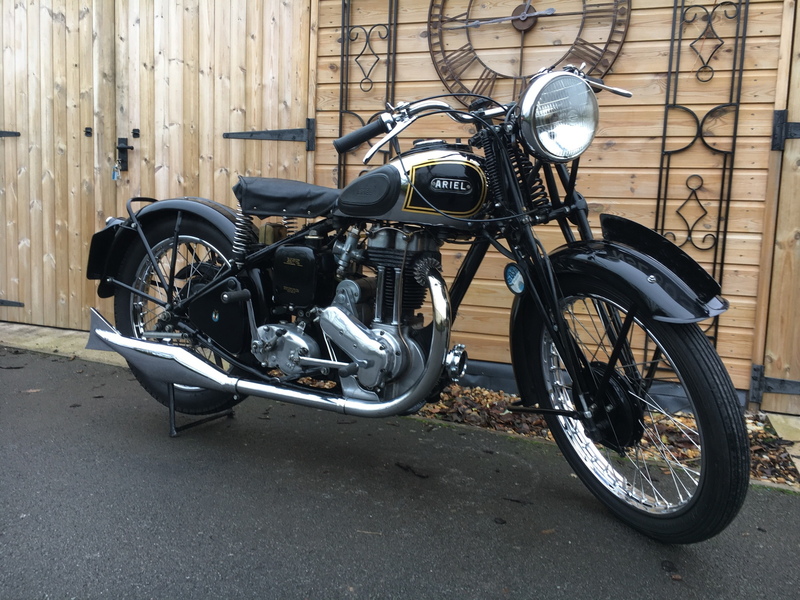 Made 1931-59. 15,641 made of all models. 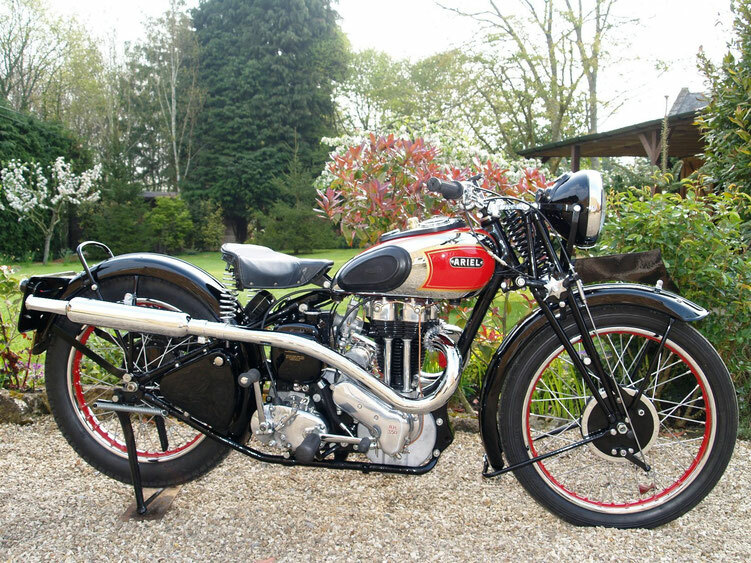 Ariel Square Four 4F 500(1931-32). 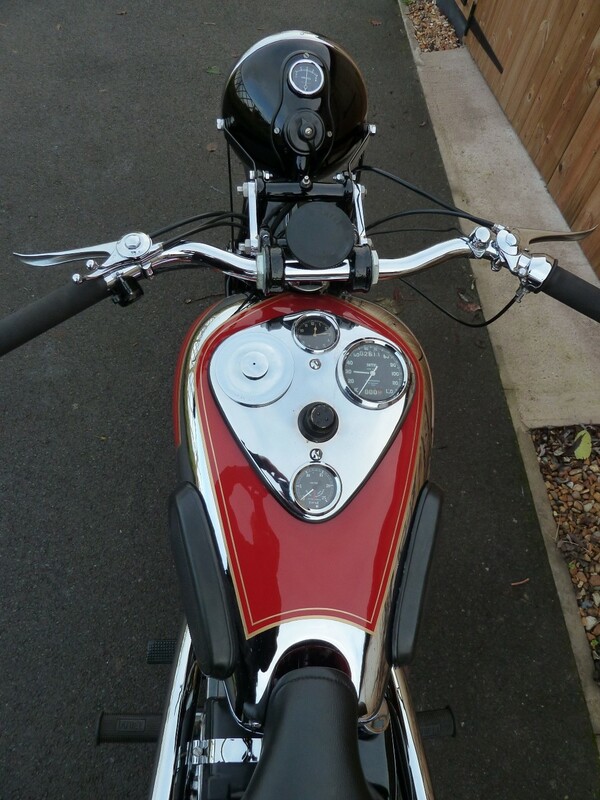 927 made. Ariel Square Four 4F 600(1932-40). 2,674 made. 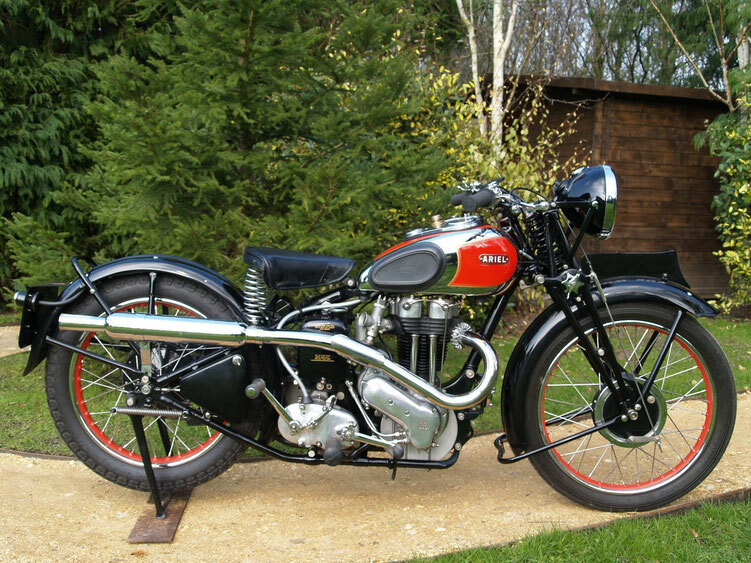 Ariel Square Four 4G (1936-49). 4,288 made. 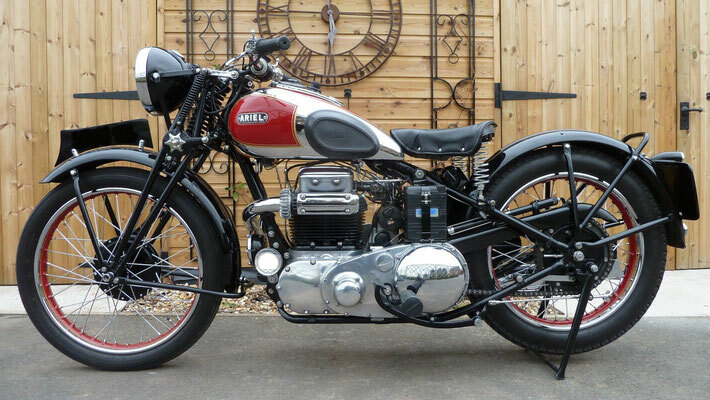 Ariel Square Four Mark I (1949-53). 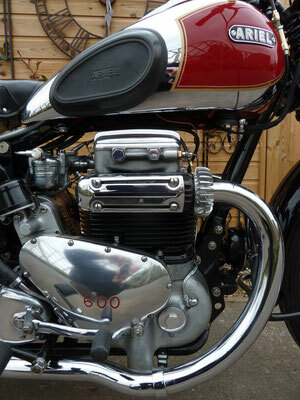 3,922 made. Ariel Square Four Mark II (1953-59). 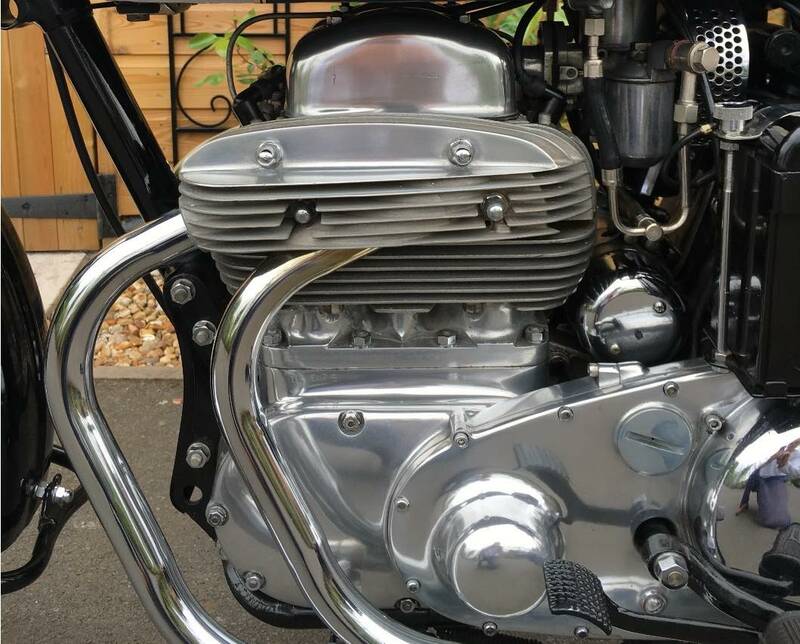 3,828 made. 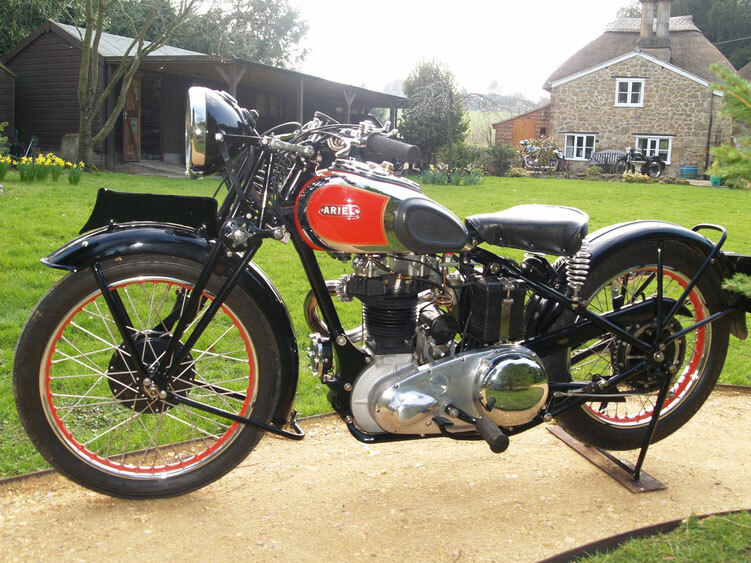 The Ariel Square Four was a British motorcycle designed by Edward Turner who devised the Square Four engine in 1928. 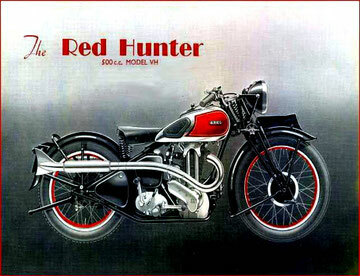 At this time he was looking for work, showing drawings of his engine design to motorcycle manufacturers. The engine was essentially a pair of 'across frame' OHC parallel twins joined by their geared central flywheels, with one four cylinder block (or Monobloc) and one head. 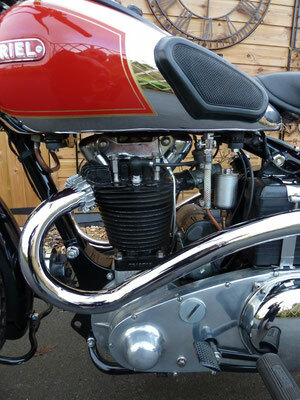 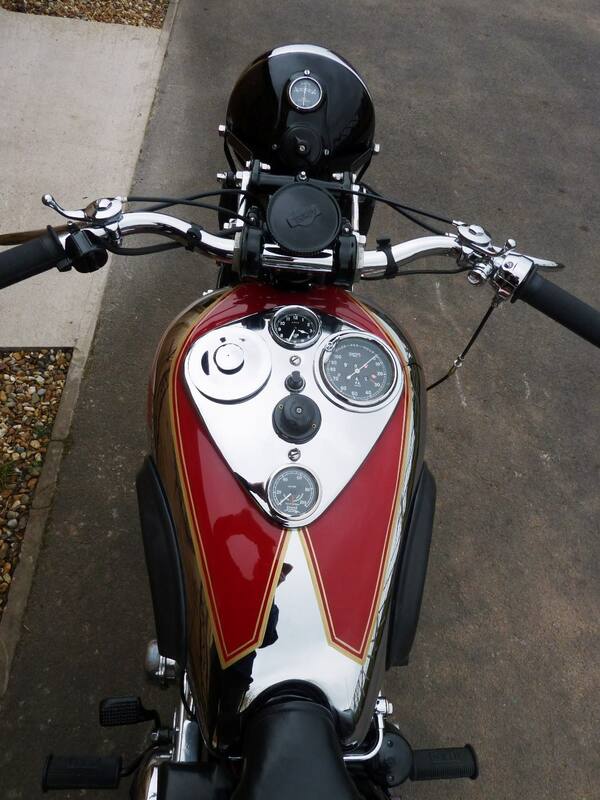 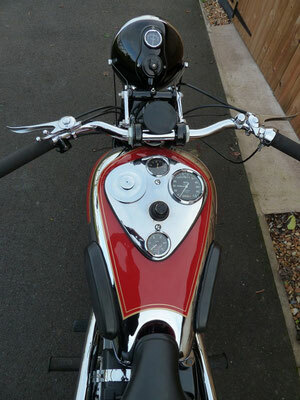 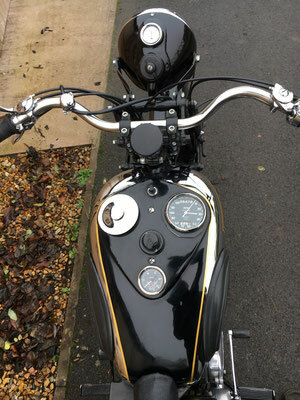 The idea for the engine was rejected by BSA but adopted by Ariel Works. 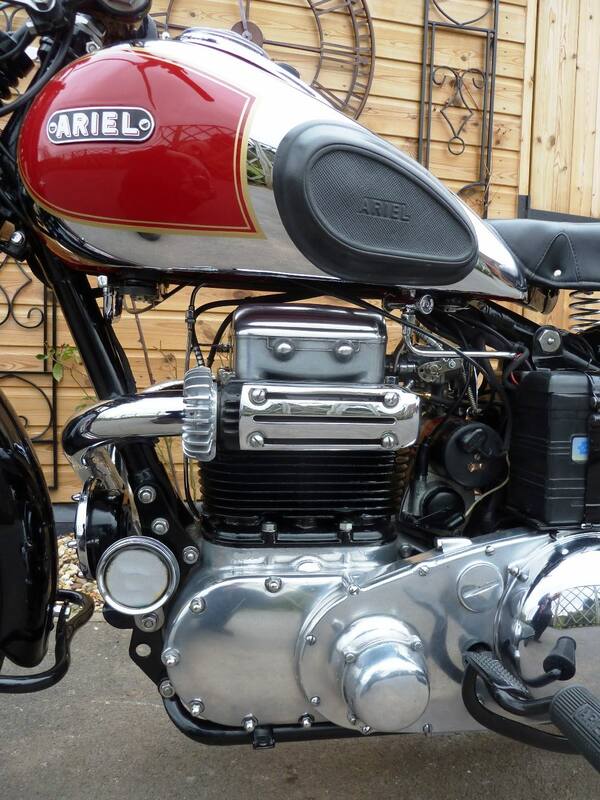 Thus it became the Ariel Square Four, and not the BSA Square Four. 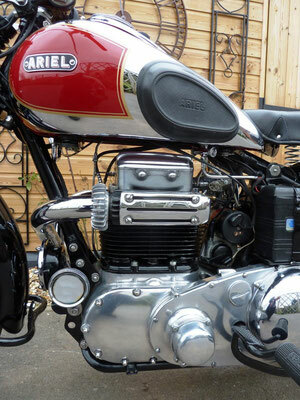 Edward Turner was then invited by Jack Sangster to join Ariel. 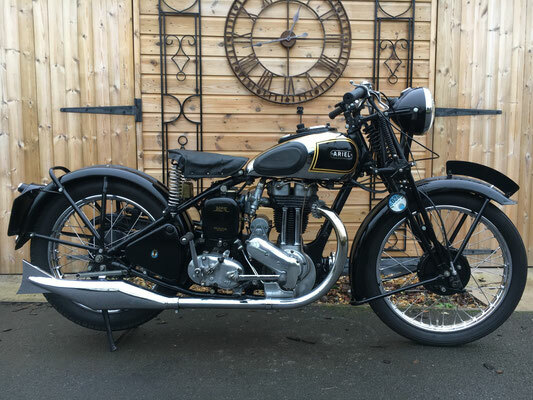 Ariel Square Four 4F (1931 - 1936). The first Ariel Square Four 4F was shown at the Olympia Motorcycle Show in 1930 in chain driven overhead-camshaft 500 cc form. 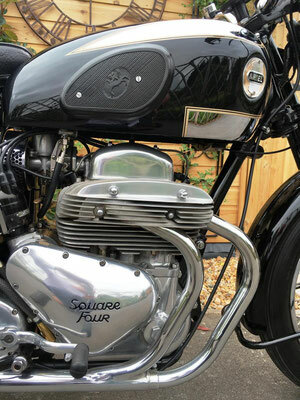 Early Square Fours used a hand-change, four-speed Burman gearbox. 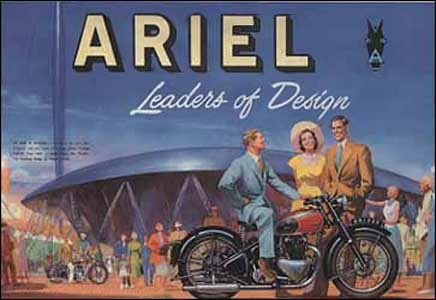 Ariel Square Four 4G (1936 - 1949). 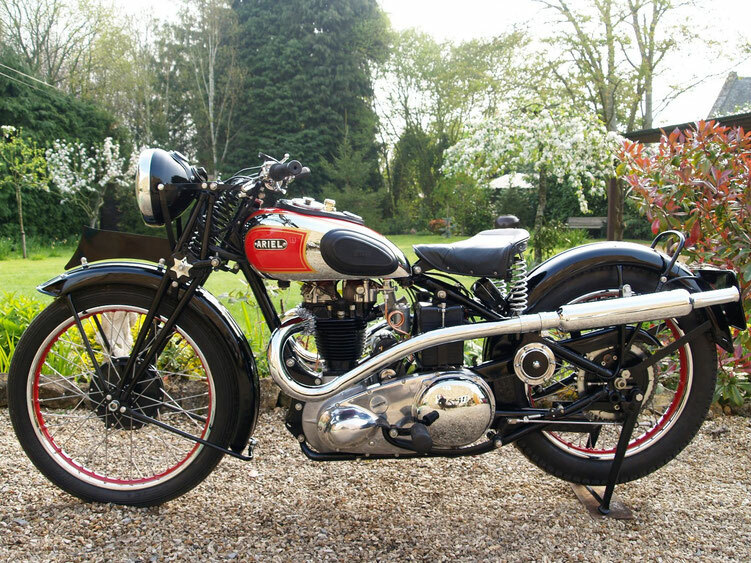 The “Cammy” engine gained a reputation for overheating the rear cylinder heads, so in 1936 the engine was completely redesigned, emerging as the 1937 OHV 995 cc model 4G. 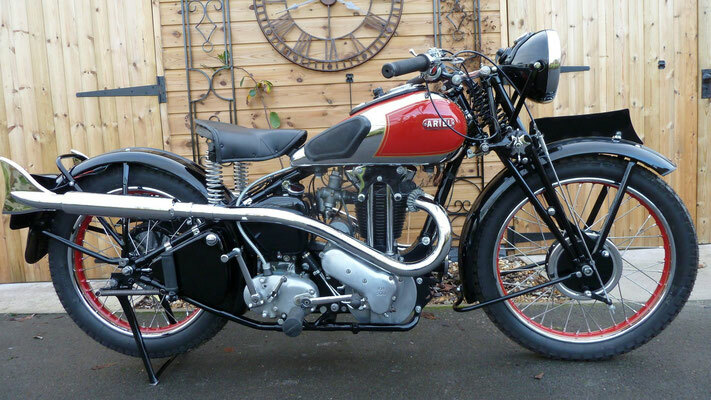 In 1939 Ariel's patented Anstey-link plunger rear suspension became an option. In 1946 the plunger rear was available again, and oil damped telescopic front forks replaced the previous girder type. 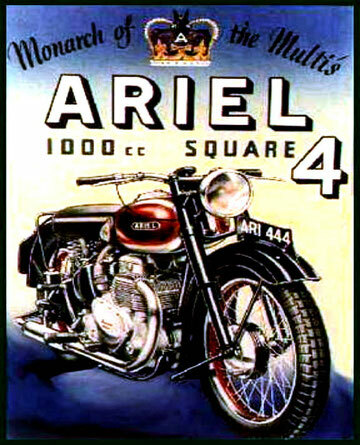 Ariel Square Four Mark I (1949 - 1953). 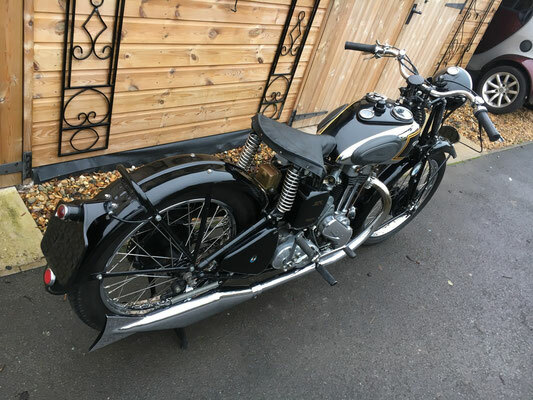 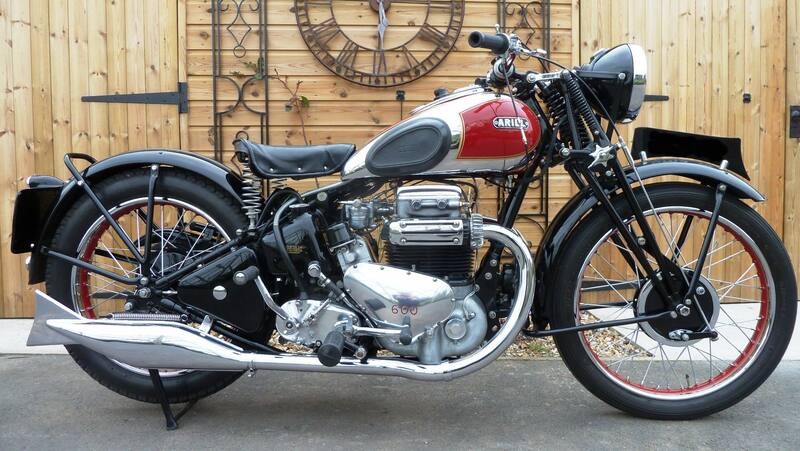 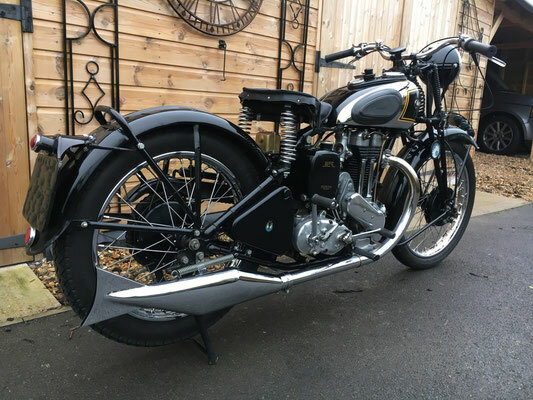 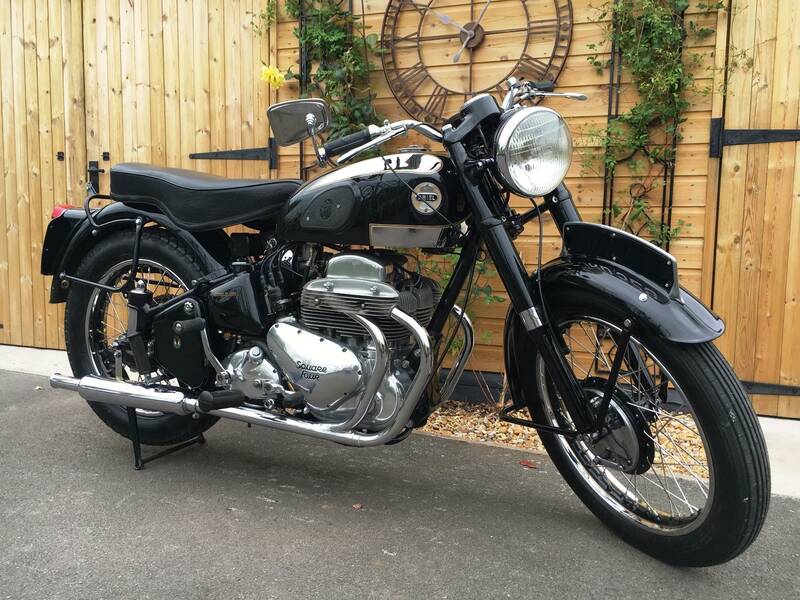 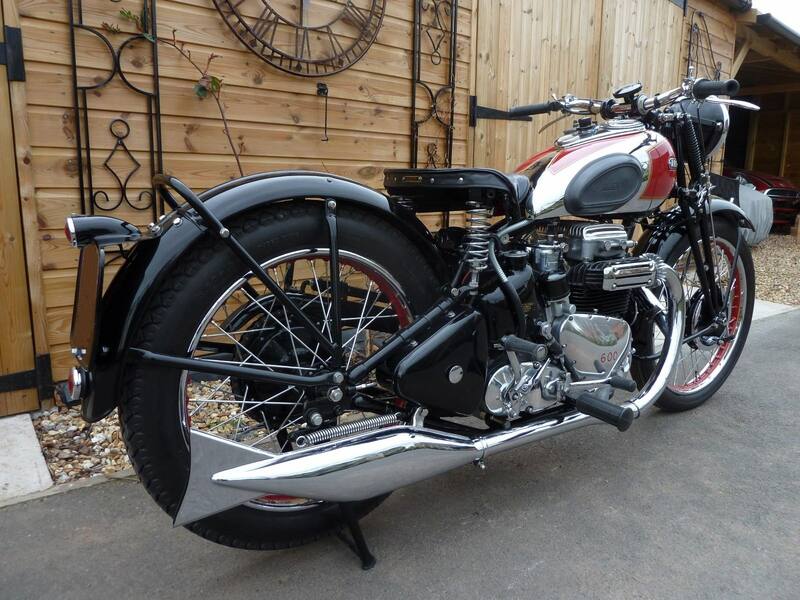 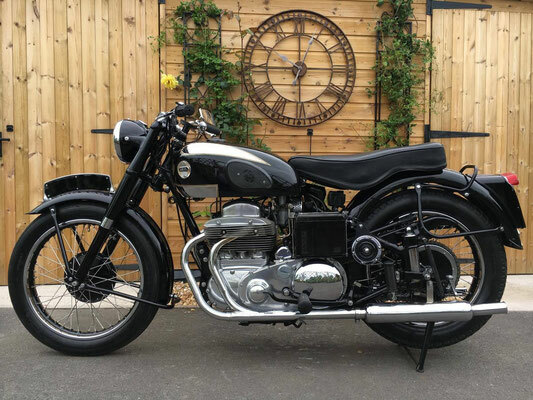 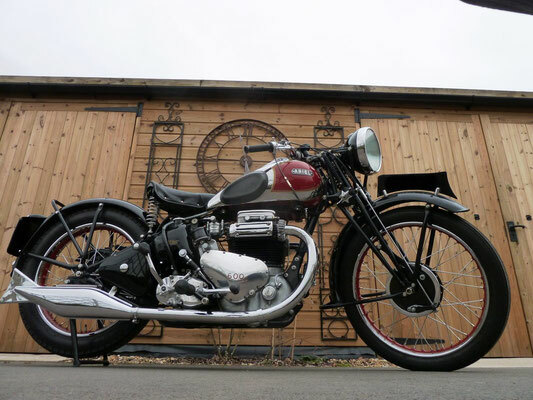 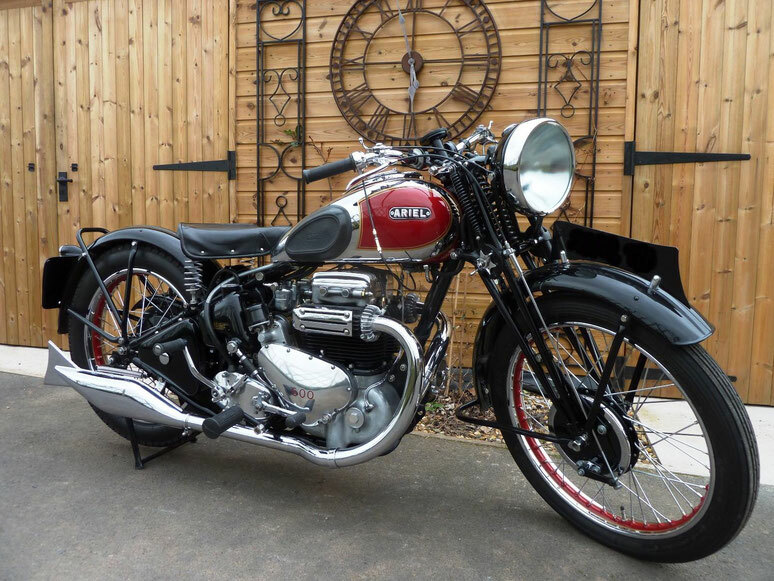 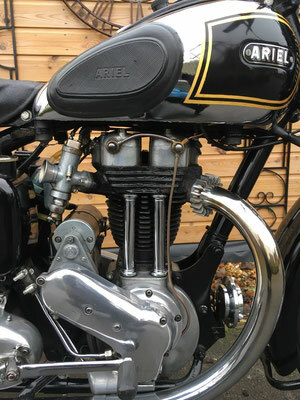 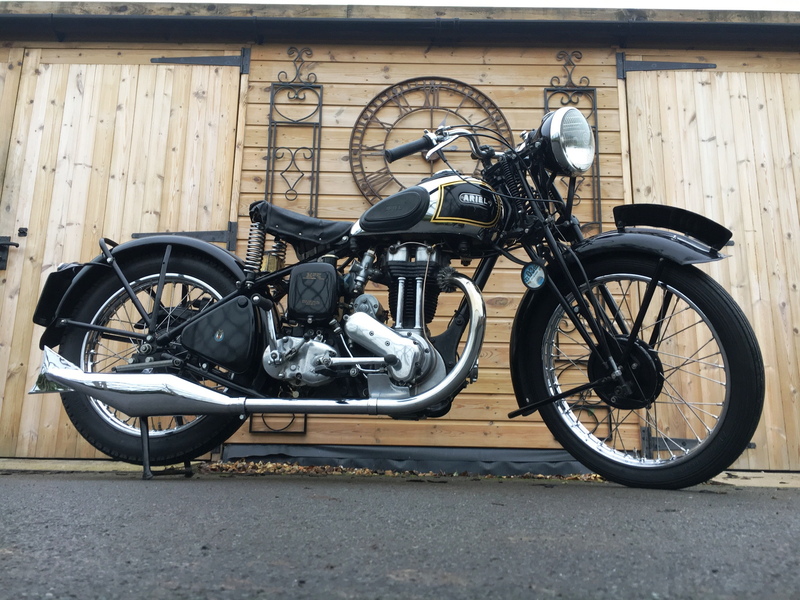 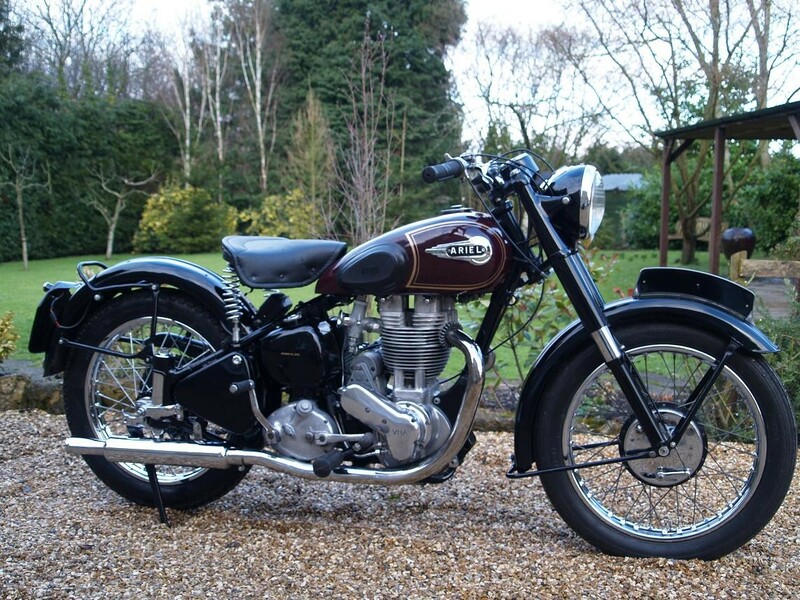 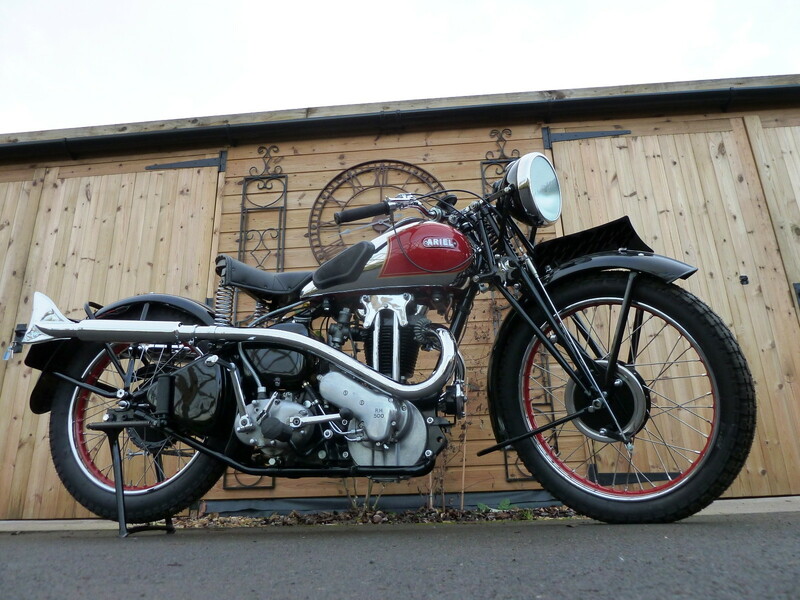 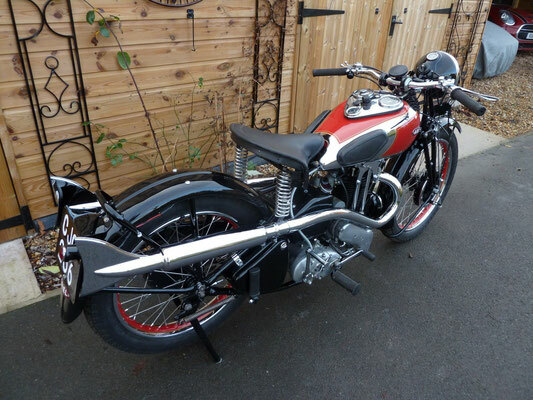 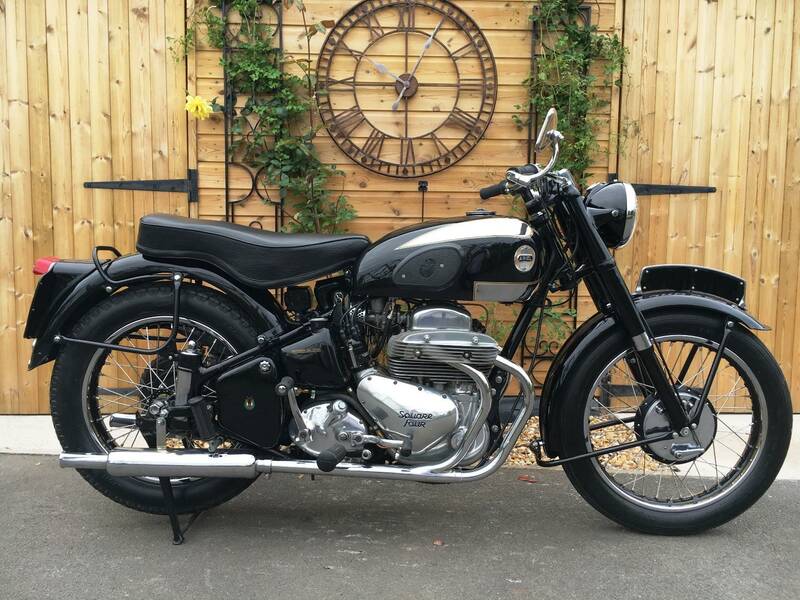 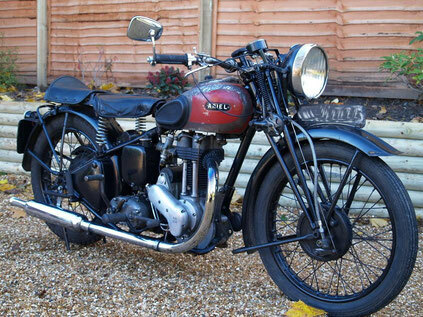 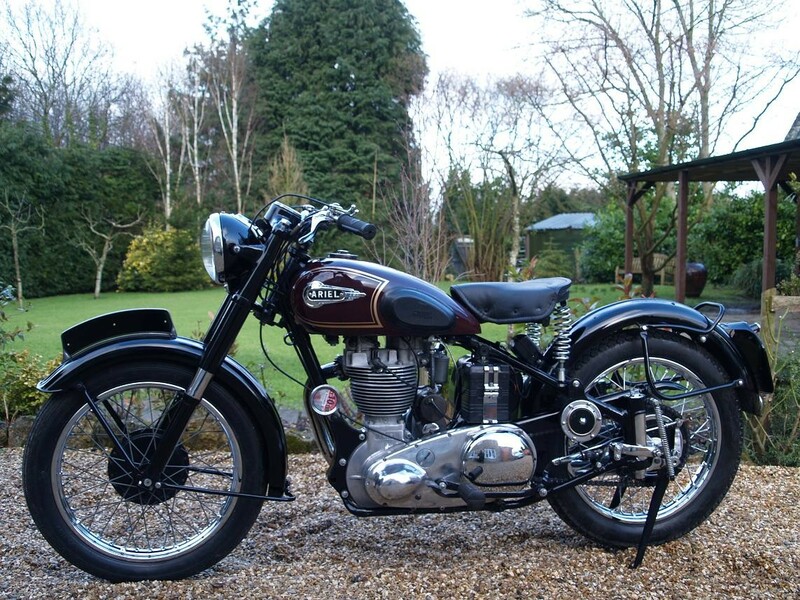 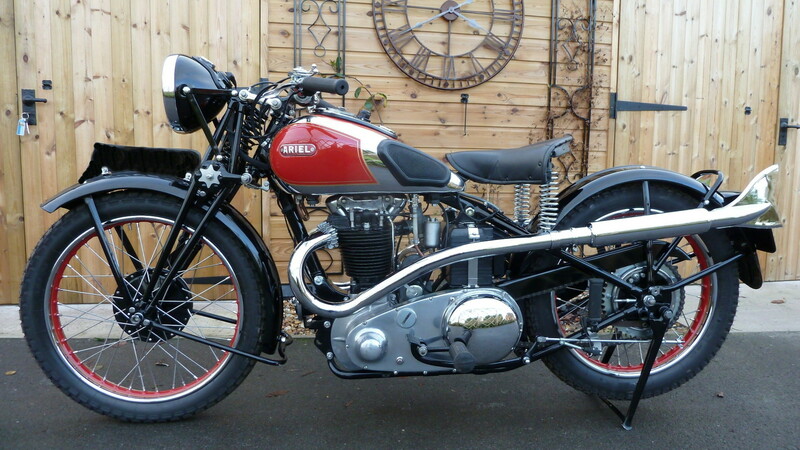 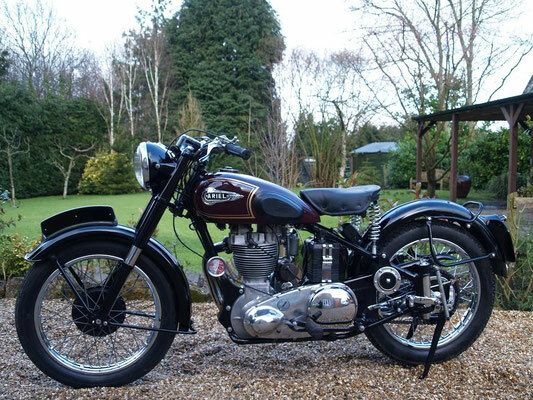 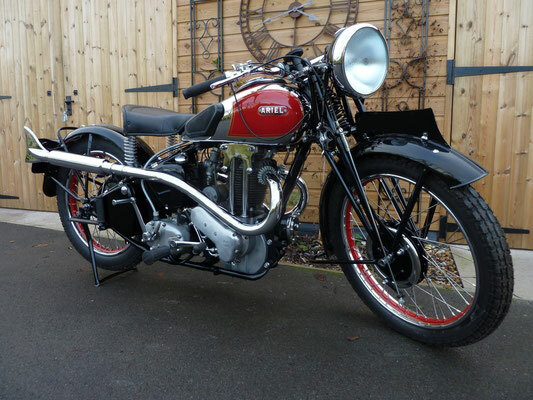 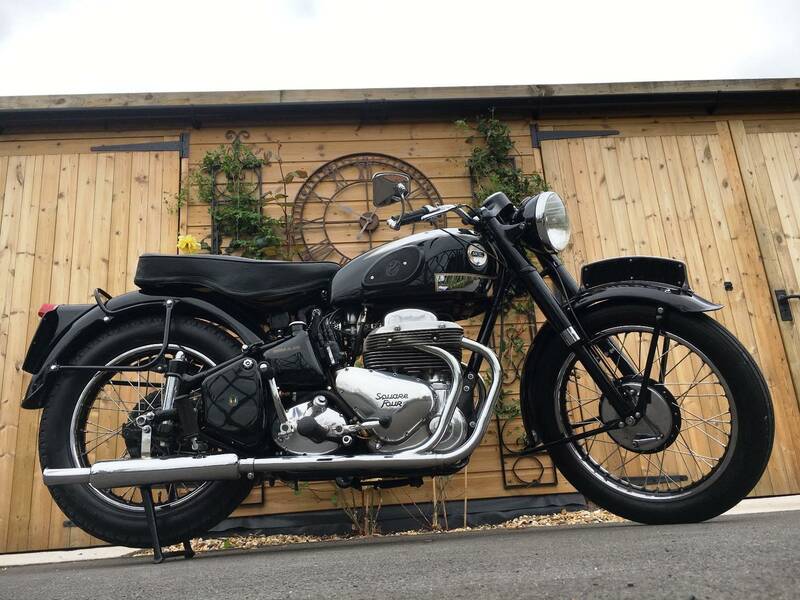 In 1949 the Ariel Square Four Mark I saw the cast-iron cylinder head and barrel replaced by alloy head and barrel. This saved about 30 lb in weight. 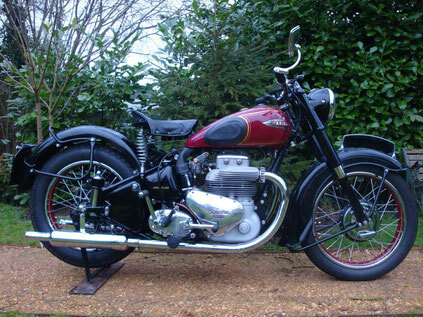 The 1949 machine weighed around 435 lb dry, produced 35 bhp at 5500 rpm and was capable of 90 mph-plus. 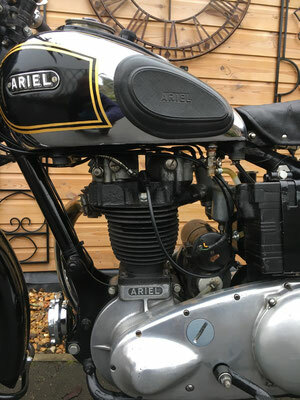 Ariel Square Four Mark II (1953 - 1959). In 1953, the ‘four pipe’ 997 cc Ariel Square Four Mk II was released, with a separate barrels and a re-designed cylinder head, with four separate exhaust pipes. 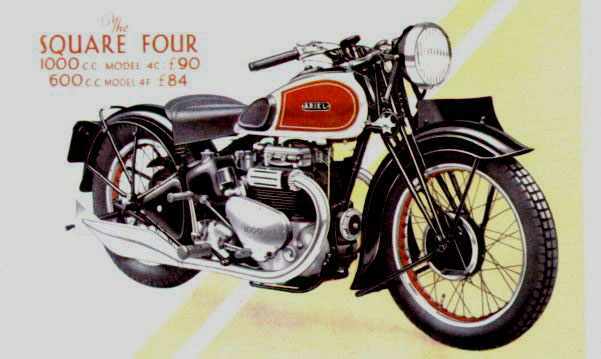 The Square Four was now a genuine 100 mph motorcycle. In 1954 Ariel built prototypes of a Mk3 with Earles forks, but the model was never put into production. 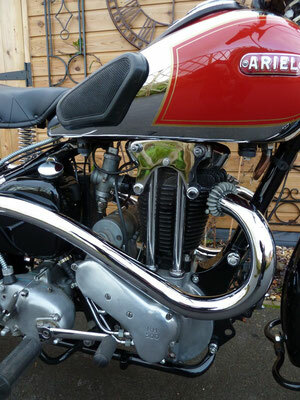 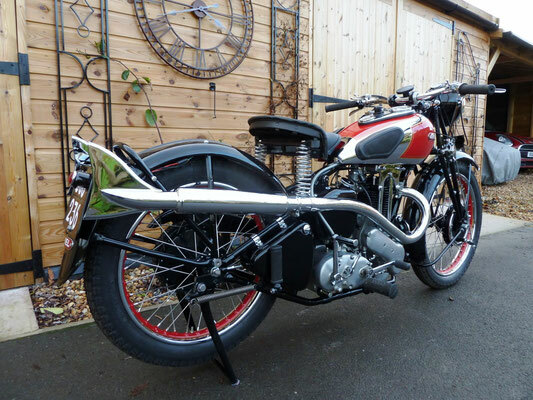 In 1959 Square Four production, and that of all other Ariel four-stroke models, ceased.